FAA plans for the expansion of the Osage City Airport call for a new, longer runway, to run parallel to the existing runway. The next step, aquisiting of private land, is schedule for next year. 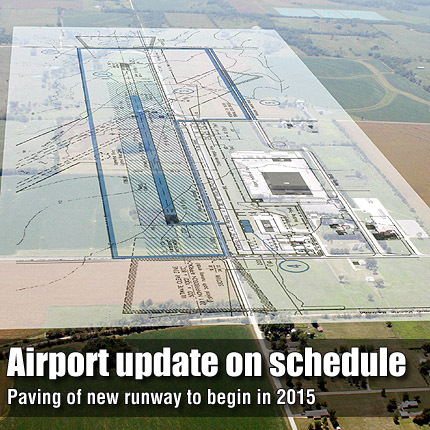 OSAGE CITY—Osage City’s airport expansion is proceeding as planned, city council members were told last week. During the Dec. 13 Osage City Council meeting Eric Johnson, of Kirkham Michael Consulting Engineers, presented a timeline of the airport project, saying land acquisition should be completed by the end of 2012. Johnson said design and surveying will be finalized in 2013; grading will begin in 2014; and paving is expected to begin in 2015. “The federal government is looking at 4.7 million federal dollars that they want to put toward that airport,” Johnson said. Council members Ed Berends and Duane Peroo questioned Johnson about the availability of funds for the project. Johnson said funds for such projects are available on an annual basis, but Congress appropriates funds for the Federal Aviation Administration’s programs each year. He said the funds “have been programmed” for about five years, but have not been appropriated. “Could that be taken away, once we start the project and get our money involved?” Berends asked. Berends said he had asked for help to verify if the funds had been appropriated. “It was there, and they said there was $4.5 million sitting in a fund for KDOT (Kansas Department of Transportation),” Berends said. Johnson said he did not know all of the mechanisms of the FAA funding, but he confirmed that KDOT and FAA work together on capital projects. Osage City Council Member Leroy Stromgren expressed concern about the required relocation of a residence adjacent to the airport.